Ohmite 100 and 200 Series Bulk Ceramic Axial Lead Resistors perform excellently where high peak power or high-energy pulses must be handled in a small size. These resistors offer bulk construction, high power dissipation, large peak energy in small size, and uniform energy distribution throughout resistor body. The bulk construction provides an inherently non-inductive resistor enabling energy and power to be uniformly distributed through the entire body of the ceramic resistor. The series axial lead resistors are constructed using three distinctly different ceramic materials to satisfy the most demanding requirements. The Type SP lead resistors can resist high operating temperatures resulting in high power dissipation. 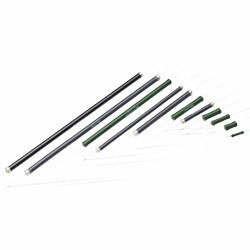 These resistors are ideal for use in oil without an oil-resistant coating. The Type AS lead resistors offer a maximum continuous operating temperature of 230C and are fit for high energy and voltage pulse applications. These resistors must have a standard dielectric coating while using in air and oil-resistant coating while using in oil. The Type SP and Type AS resistors are ideal for use in RC snubber circuits, spark-gap limiters, pulse waveform, RF dummy load circuits, and capacitor dump circuits. The Type BA resistors are ideal for high energy and voltage pulse applications where the needed resistance value is above Type SP and AS resistors’ values. These resistors provide a maximum continuous operating temperature of 230C. The Type BA resistors need a standard dielectric coating for use in air and an oil-resistant coating for use in oil. Typical applications include voltage divider, voltage balancing, filter, snubber, crowbar, measuring, and test loads.